My Daily Art Display is another first. It is the first time my chosen painting has been a still-life. Still-life paintings are not one of my favourite art genres but I do admire the skill of the artist who paint still-life subjects. So what does one mean when one talks about still-life works of art ? Still-life paintings are works of art, which, in the main, depict inanimate objects. Such inanimate objects maybe either natural, such as flowers, plants and food or they may be man-made objects, such as vases, jewellery, books and drinking vessels etc. The history of still life painting can be traced back as far as Ancient Greek and Ancient Egyptian times. If one goes back to the Ancient Egyptian times one has learnt that among the items found in their burial chambers in those days were still life paintings of the deceased’s favourite foods. These were placed with the mummified body in the belief that they would travel to the after-life with the deceased and when he or she arrived there, the food would become real and available for use by the now re-born person. An artist painting a still life, of course, had more scope in arranging the design within a still life composition than a landscape or portrait painter had when transferring their subject on to canvas. Still life artistry developed separately in the Netherlands in the late sixteenth century and this term “still life” probably derives from the Dutch word “stilleven”. Illustrations in illuminated manuscripts were often decorated along the borders with intricate displays of flowers. Later when books took over from illuminated manuscripts the same artistry was used in scientific botanical illustrations. Another favourite item to feature in “still-life” paintings, especially those of Northern Europe, was food and kitchenware. These, often massive works of art, were favoured by the Flemish artists of the time, such as Pieter van Aelst and Joachim Beuckelaer. At the beginning of the seventeenth century oil paintings of flowers became very trendy. Another style of still life painting was known as “breakfast paintings” which were works of art which not only represented a literal presentation of the food which the upper-class of the time would consume but they would be a religious reminder to steer clear of one of the seven deadly sins – that of gluttony. This brings me nicely to our artist of the day and his still life painting. My Daily Art Display artist for today is the Dutch artist Willem Claeszoon Heda. Heda was born in Haarlem in 1594 and devoted all his artistic life to still life painting. His father Claes was the city architect for Haarlem and his uncle Cornelis Claesz Heda was a painter. Willem Heda was to become, along with his countryman Peter Claesz, one of the most important representatives of ontbijt (breakfast piece) painting in the Netherlands. Today’s painting entitled Still Life of Food and Drink was completed in 1631. This is one of five known still-life paintings featuring items of food and drink on a simple table by Heda. 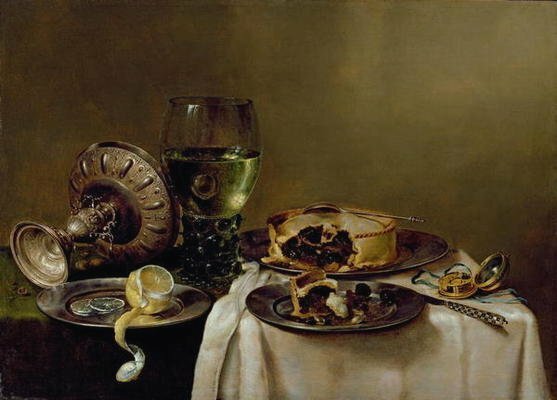 On the food tables that he painted, one would often see mincemeat pies, ham and oysters. Today’s painting by Heda is a Vanitas. A Vanitas is a symbolic type of work of art which was associated with Heda and other Northern European artists in Flanders and the Netherlands during the 16th and 17th centuries. The word is Latin and means “emptiness”. Vanitas works of art were usually still-life pictures depicting an object or group of objects symbolising the shortness of life on earth and the transience of all earthly pleasures and triumphs. In today’s painting we see left-over, half eaten mincemeat pies which will soon decay and be gone, symbolising the brevity of life. On the table we can also see a knife, an upturned tazza, a glass römer goblet and a timepiece, the latter being another symbol of the passing of time. The peeled lemon alludes to a deceptive appearance – beautiful to look at but sour tasting. The half-peeled lemon appeared in a number of Heda’s still-life paintings of the time and was clearly favoured for artistic reasons, lending strong colour to the picture. Lemon was also used in those days to improve the taste of wine. The painting is characterized by subdued, close tonal harmonies. Heda wanted to contrast the different textures of the objects on display – the dull sheen of the pewter plate and the gloss of the upturned silver tazza. For this painting, Heda painted a plain, softly illuminated background which gave a fleeting appearance that the objects in the foreground were floating.